DISCLAIMER: Recent conversations with the Copyright Office have led me to change my stance regarding blogs and copyright registration. Please see this post for my updated views. I’m working on my first ebook, which is tentative titled The Legal Side of Blogging. During law school, I wrote a substantial research paper on copyright, defamation, and privacy issues related to blogging. I also wrote a blog series called Can My Blog Get Me Sued, Arrested, Fired, or Killed. It made sense to combine the material from these two projects and present them in a way that was useful to the average blogger for my first solo book project. Blogs didn’t exist when the Copyright Act was written or last revised. The drafters only considered literary works that are published on paper when they wrote the law. When it comes to copyrighting blogs and websites, the best we can do is to try to find the digital equivalent to the works published on paper and register them accordingly. The purpose of the Copyright Act is to protect advancements in the arts and sciences by giving authors and artists protection for the works they create. Copyright protection is afforded to every original expression that is fixed in a tangible medium. The law was written to protect things like books, photographs, music, sculptures, paintings, and audiovisual works. Works that exist only in an electronic form are fixed in a tangible medium, and thus, the law protects them. I’ve spent hours considering the copyright implications of blogging and discussed it at length with my cyberspace law professor. We came to the conclusion that bloggers who blog on a set schedule are most like people who write a column in a newspaper or a magazine; and therefore their blogs should be able to be registered as serial works. 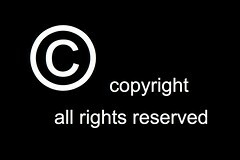 A single work can be registered with the United States Copyright Office for $35. If you publish a blog every week and register it, that will cost $1820 each year. The benefit of having a serial work is that you only have to register it every 3 months for $65, which is only $260 for the year. This saves a lot of time and money. This week I was working on my ebook and I needed some clarification on how bloggers should go about registering their works, so I called the Copyright Office. The operator was very helpful in directing me to the circular on serial works, and she thought my ebook idea was interesting. About five minutes later, I had a follow up question so I called her back. She said she was glad I called back because she needed to tell me that blogs cannot be registered as serial works. The only thing a blogger can do is register each post individually! I can see the Copyright Office requiring individual registrations for each post for someone who only writes sporadically; but this rule makes no sense for someone who posts on a weekly basis. They should be given the same protection as any other writer who publishes in a similar fashion in a newsletter, journal, or magazine. Thankfully, the law protects writers’ and artists’ work the second a work is created, not from the date it is registered. The benefit of copyright registration is that you get to collect attorneys’ fees and statutory damages if someone steals your work and you successfully sue them. I used to think that the best thing a blogger can do is register their blog as a serial work and use Google Alerts to monitor the internet for possible infringement. With this latest development, it makes more sense not to register every blog post you write, but only those that you expect someone will try to pass off as their work. You can still use Google Alerts to police the internet for potential infringers. You just won’t be eligible for attorneys’ fees or statutory damages if your work hasn’t been registered within 3 months of publication if you find that someone is passing off one of your blog posts as their own. However, you can probably still get the post removed from the infringer’s website using a takedown notice under the Digital Millennium Copyright Act. Can’t I send them in via the postal service as printed copies every three months? Thank you so much for the article! I’ve spent hours looking for such an article! I’ve thought about that too. I think a person who blogs on a regular basis should be able to register their copyright as a serial work. I would love to challenge this rule once I am a licensed attorney. Remember, I’m not an attorney and my blog is never legal advice; but, here are my thoughts on what might go wrong if you try to register your blog as a serial work. 1. The Copyright Office will see through what you’re trying to do and they’ll reject your application for copyright registration without refunding your application fee. When I called the hotline, the woman was very clear that a website cannot be a serial work. I think they might be suspicious if the work you send them doesn’t have the same look and feel as newsletters, periodicals, and other works they accept as serial works. 2. If you bring a claim against someone for infringing on your registered copyright, the person you bring a claim against may successfully argue that you don’t have a valid registered copyright. Their argument could be bolstered by the fact that you registered your blog as a serial work when you knew that the Copyright Office doesn’t allow that. The court could say that you don’t have registered copyright and so you’re only eligible for actual damages. So in the end you wouldn’t have a registered copyright, you’d be out your application fees, and your damages is probably severely lowered unless you or your infringer is making a lot of money off your blogs. It’s a shame because my site is not really a blog perse…. I write self help articles and spiritual philosophy. Best of luck with your writing! The Copyright Office said you can still register your work as individual literary pieces, just not as a serial work. I know some bloggers combine their writings and re-release them as an ebook. If you did that, all your work could be registered using one application and fee. It’s actually possible, and cheaper, to register your blog as a Literary Work and simply ‘update’ your copyright every 3 months as a Derivative Work with the additional content of everything you’ve written in that 3 month period. Sarah Bird gives the details here. That’s a very interesting idea. Have you done it? I see that your blog is copyrighted. Which method did you use? Did you copyright your domain instead. I would love to know. Thanks so much. I got copyright protection in my work the second I created it. When I register my work, I’ll register it as a literary work with the US Copyright Office. Every 3 months I’ll register the entire blog again as a derivative work of the original. Ruth, what are your thoughts on this … although this is somewhat cumberson. Write a lot of content ahead of time and file a copyright for an ebook that consists of the actual post titles and content that you plan to publish in the future. Copyright ebook. Then publish on blog with notice on each post that this is excerpted from a copyrighted work. You wouldn’t ever really publish or distribute the ebook, but a copy would be on file as a result of what was filed at the copyright office. Of course, you can’t be spontaneous about blogging, but then it’s protected up front. It accomplishes what you’re doing. And you can make it a serial book so to speak. Or you can just have all your good work published in ebook form like mentioned above and then spontaneous blog out the lighter, fluffier stuff that you aren’t as concerned about when it comes to copyright. I guess you could do that, but you’ve already identified some of the problems with that plan – it wouldn’t apply to any content that you create in response to current events and your content may not be relevant when you actually release it. The best way I’ve heard to copyright a blog is to copyright the entire content of your blog as 1 work and then every 3 months register the entire content of your blog again as a derivative work of the original work you registered. Ruth, any update on how best to register your blog? Serial work, each individual post or as a literary work with derivative updates each 3 months?